Sec.1: Rd.5: Aaron Tennant (IRE) bt Connor Rabey (GUE) 21-20, Izzat Dzulkeple (MAS) bt Martin Sham (HKC) 21-11, Corey Wedlock (AUS) bt Rob Law (CAN) 21-18, John Fleming (SCO) bt Carlos Tigere (BOT) 21-7, Aaron Teys (AUS) bt Gariga Babona (PNG) 21-6. Rd.6: Fleming bt Lawrence Paniani (CKI) 21-16, Teys bt Tennant 21-11, Dzulkeple bt Tigere 21-9, Wedlock bt C Rabey 21-16, Law bt Babona 21-20. Current standings: Wedlock 18 points +57 shots, Teys 15 +46, Dzulkeple 12 +16, Fleming 12 +13, Tennant 9 -8, Babona 6 -7, L Paniani 6 -7, C Rabey 3 -15, Law 3 -19, Sham 3 -24, Tigere 3 -52. Sec.2: Rd.5: Sheldon Bagrie-Howley (NZL) bt Billy Johnson (AUS) 21-19, Budriz Mustakim (MAS) bt Kenneth Ikirima (PNG) 21-11, Nathan Pedersen (AUS) bt Ross Davis (JER) 21-16, James Po (HKC) bt Lucas Caldwell (CAN) 21-13, Daniel Salmon (WAL) bt Taiki Paniani (CKI) 21-19. Rd.6: Salmon bt Bagrie-Howley 21-15, Davis bt Caldwell 21-11, Johnson bt Ikirima 21-5, Pedersen bt Mustakim 21-7, Po bt T Paniani 21-11. Current standings: Salmon 18 points +29 shots, Mustakim 15 +35, Bagrie-Howley 15 +22, Pedersen 12 +44, Johnson 12 +38, Davis 6 -3, Po 6 -15, T Paniani 3 -41, Ikirima 3 -54, Caldwell 0 -55. Sec.1: Rd.5: Kristina Krstic (AUS) bt Piwen Karkar (PNG) 21-4, Pricilla Westlake (CAN) bt Lesego Motladiile (BOT) 21-12, Linda Zakaria (MAS) bt Emma Snell (GUE) 21-0, Chloe Stewart (AUS) bt Ysie White (WAL) 21-18, Shae Wilson (NFI) bt Joey Luk (HKC) 21-6. Current standings: Stewart 18 points +68 shots, Westlake 15 +46, Zakaria 12 +45, Wilson 12 +30, Krstic 12 +46, Motladiile 9 -9, White 6 -8, Mataio 3 -17, Karkar 3 -54, Luk 0 -61, Snell 0 -66. Sec.2: Rd.5: Claire Walker (SCO) bt Colleen Paniani (CKI) 21-9, Syafiqah Rahman (MAS) bt Tiffany Brodie (AUS) 21-12, Connie Rixon (MLT) bt Tayla Bruce (NZL) 21-10, Ellen Ryan (AUS) bt Angel So (HKC) 21-10, Sophie Rabey (GUE) bt Nicole LeBlanc (CAN) 21-19. Rd.6: Brodie bt Rixon 21-13, Ryan bt Rahman 21-9, Bruce bt Walker 21-10, S Rabey bt C Paniani 21-20, LeBlanc bt So 21-15. Current standings: Rahman 15 points +47 shots, Ryan 15 +45, Bruce 12 +32, Rixon 12 +21, Brodie 12 +16, Walker 9 +19, So 6 -9, S Rabey 6 -49, LeBlanc 3 -61, C Paniani 0 -71. Sec.1: Rd.5: Tayla Bruce, Sheldon Bagrie-Howley (NZL) bt Joey Luk, Martin Sham (HKC) 15-9, Ellen Ryan, Aaron Teys (AUS) bt Tiffany Brodie (AUS), Kenneth Ikirima (PNG) 19-6, Linda Zakaria, Izzat Dzulkeple (MAS) bt Shae Wilson (NFI), Aaron Tennant (IRE) 16-14, Nicole LeBlanc, Rob Law (CAN) bt Emma Snell, Connor Rabey (GUE) 13-11, Ysie White, Daniel Salmon (WAL) bt Lesego Motladiile, Carlos Tigere (BOT) 11-9. Current standings: Ryan, Teys 12 points +38 shots, Bruce, Bagrie-Howley 12 +6, White, Salmon 9 +3, Luk, Sham 6 +4, Zakaria, Dzulkeple 6 +2, Motladiile, Tigere 6 -1, Wilson, Tennant 2 -9, LeBlanc, Law 6 -10, Mataio, T Paniani 6 -10, Snell, C Rabey 3 -5, Brodie, Ikirima 3 -18. Sec.2: Rd.5: Kristina Krstic, Nathan Pedersen (AUS) bt Colleen Paniani, Lawrence Paniani (CKI) 23-6, Sophie Rabey (GUE), Ross Davis (JER) bt Chloe Stewart, Corey Wedlock (AUS) 14-12, Piwen Karkar, Gariga Babona (PNG) bt Angel So, James Po (HKC) 14-9, Connie Rixon (MLT), Billy Johnson (AUS) bt Syafiqah Rahman, Budriz Mustakin (MAS) 20-10, Pricilla Westlake, Lucas Caldwell (CAN) bt Claire Walker, John Fleming (SCO) 16-11. Current standings: Krstic, Pedersen 15 points +42 shots, Walker, Fleming 12 +33, Westlake, Caldwell 12 +12, Rixon, Johnson 9 -2, Stewart, Wedlock 6 +25, Rahman, Mustakin 6 -2, S Rabey, Davis 6 -38, So, Po 4 +4, Karkar, Babona 3 -30, C Paniani, L Paniani 1 -44. NOTE: Rains and high winds associated with ‘Tropical Cyclone Debbie’ prior to the scheduled start time, forced the abandonment of Mixed Pairs Round 6. 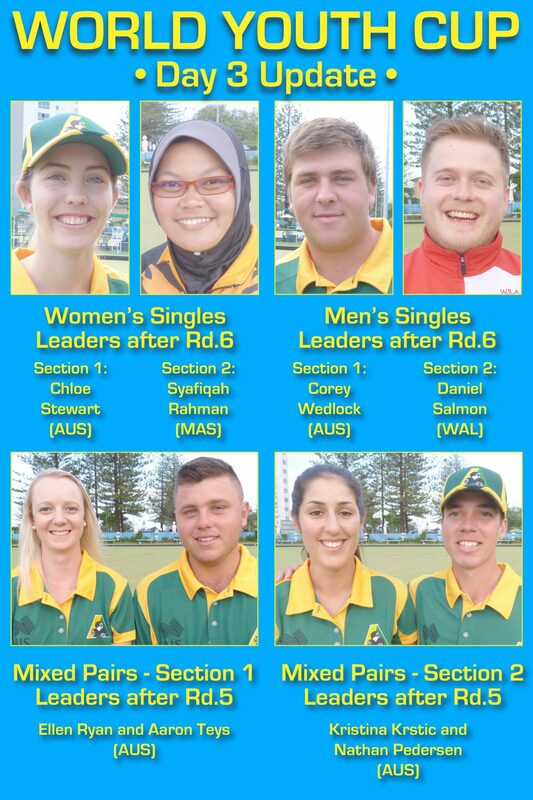 With more inclement conditions forecast tomorrow, the competition moves indoors to the Tweed Heads Bowls Club, where a full day of mixed pairs will be presented. It is anticipated that play will resume at Broadbeach on Friday morning.